Here is the speech given by musician Brian Eno at the "Illegal" Troops Out demo, Trafalgar Square, London on Monday, October 8, 2007. According to the Stop The War Coalition, about 5,000 people turned up for the demonstration, which got the go-ahead at the last minute. "Amid the past week's political sound and fury, one subject slid unnoticed under the platform. Britain is at war. Its soldiers are fighting and dying in two distant lands. Foreign policy, once the stuff of national debate, is consigned to cliché and platitude. "With casualties mounting in Iraq and Afghanistan, politicians dare not mention it, let alone disagree. The prime minister declared to his party conference in Bournemouth that 'the message should go out to anyone facing persecution anywhere from Burma to Zimbabwe... we will not rest'. Britain will defend the oppressed anywhere in the world. Unfortunately Britain is doing nothing in Burma or Zimbabwe, while the message from Iraq and Afghanistan is that Britain chooses bad wars at America's behest in which it gets beaten. "All the airbrushing in the world will not remove the greatest legacy that Tony Blair left his successors, that of 'liberal interventionism'. Never articulated except in a confused speech in Chicago in 1999, it asserted Britain's right to meddle in any country to which it took offence, under the rubric of 'humanitarian just war'." Now Simon Jenkins isn't a crazy leftist firebrand - I'm not even sure what part of the political spectrum he occupies, but it probably isn't the same as mine. However, I trust his intellectual honesty in a way that I can no longer trust the honesty of most of our government. Sit down protest moved by police. "Britain's right wing press, politicians and commentators have an unshakeable habit of working themselves into a fury about power-sharing in Europe. They see themselves as the great defenders of British sovereignty, against the political ambitions of our continental partners. "Yet those same people remain largely silent over the transfer of British sovereignty in crucial areas of national security to The United States. We have been conned into an illegal invasion by shameless propaganda and media manipulation. We have a foreign policy in place that is hugely unpopular, but which continues nonetheless. We have risen to third place in the rankings of arms-exporting countries. And here we are today at a demonstration that has been declared illegal. "In a three-paragraph written statement slipped out in July, just one day before Parliament rose - and almost completely unnoticed by the press - the Defence Secretary announced that the Government is permitting the US administration to install additional equipment at Menwith Hill, in Yorkshire, to support its unproven missile defence system. "The political will to persevere with it has been driven as much by industrial as military priorities. Its original justification was to defend against China: now it is said that it will protect against Iran, depicted in Washington as an implacable, long-term enemy." What this says to me is that the current American government - and ours, for as long as we follow them - thrives on a state of war. They need it because it allows them to carry on with business as usual whilst at the same time suppressing dissent "for security reasons". It allows them to sidestep the democratic process by maintaining a continuous state of emergency. For the sake of our country, and Iraq - as well as for the sake of all those who in the future are going to be cast as "our enemies", we must get off this war-mongering treadmill. Our government talks about our "special relationship" with America, but we should be asking how special that really is. And I think we should be looking at another relationship we have that seems to me much more special: that with Europe. If we'd followed the European line rather than the American, it's likely not only that we wouldn't have been part of this stupid invasion, but that it wouldn't have happened at all. Our cooperation was what gave the Americans the figleaf to cover the dirty little secret that this was an invasion carried out for their benefit alone. Our complicity made it look acceptably international. In the last couple of weeks several people at the BBC have resigned because someone called a cat Socks instead of Cookie, and because the Queen was wrongly depicted as being in a huff. At the same time we are waging and losing a pointless war that has killed perhaps as many as one million people. Will there ever be any resignations over that? We have a serious problem on our hands. We have a government that was elected by 22 per cent of the eligible voters, but somehow gained 55 per cent of the seats in Parliament. We have been conned into an illegal invasion by shameless propaganda and media manipulation. We have a foreign policy in place that is hugely unpopular, but which continues nonetheless. We have risen to third place in the rankings of arms-exporting countries. And here we are today at a demonstration that has been declared illegal. Is this what we mean by democracy when we so proudly export it - in missile form - to other countries? Note: Brian Eno is a musician. Visit Stopwar.org.uk. and http://www.indymedia.org.uk/en/2007/10/383247.html. The following commentary ran on the Guardian website on October 6, 2007 where musician Brian Eno urged everyone to take part in a march from Trafalgar Square to Parliament Square on October 8 to protest against the war in Iraq and to call for the immediate withdrawal of troops. 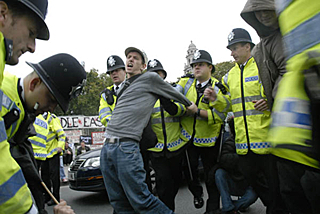 Eno wrote: "Using an archaic law (the 1839 Metropolitan Police Act), that demonstration has now been banned." Our leaders would undoubtedly be happy if we "moved on" from Iraq. They don't want to talk about it any more: it was a dreadful blunder, and reflects little credit on any of them. Presumably this is why the question has hardly been debated in parliament. Although the majority of the public were always against the war, this was not reflected by their elected representatives. The government behaved in a way that was transparently undemocratic but the Conservatives won't call them on it, for without their almost unanimous support the whole project couldn't have happened. But to conveniently forget Iraq now is to forfeit the only possible benefit the war might have: the chance to rethink the dysfunctional political system that got us into this hole. If we don't, we risk digging a series of ever deeper holes. The Iraq adventure was justified as the planting of a beacon of democracy in the Middle East. Not only did it utterly fail at that, it also undermined our democracy. Appealing to our paranoia more than our vision, George Bush and Tony Blair obtained restrictions on freedoms that had taken centuries to evolve. They said these were necessary to ensure our security - a device used by authoritarian leaders since time immemorial. Civil liberties never seem important until you need them. But by definition, that is the very time you won't be able to get them, so they have to be in place in advance, like an insurance policy. In his book Defying Hitler, the historian Sebastian Hafner describes how Germany slid into nazism. At first people laughed at Hitler and played along with what seemed trivial changes in the law. For most Germans it was all rather abstract, and they were expecting things to return to normal when Hitler faded back into obscurity. Only he didn't, and civil liberties were so compromised there was no way to stop him. If we don't stand up about Iraq then we tacitly sanction the next steps in this deadly experiment of democratic evangelism. Those will likely include an attack on Iran, a permanent force of occupation in Iraq (probably always the intention), the complete militarisation of the Middle East, and a revived nuclear future. Stop the War Coalition planned a march from Trafalgar Square to Parliament Square on Monday (October 8, 2007) - the day parliament resumes - to draw attention to the fact that a lot of us are still thinking about Iraq and to call for the immediate withdrawal of troops. 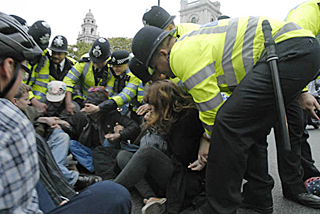 Using an archaic law (the 1839 Metropolitan Police Act), that demonstration has now been banned. Now why would that be? Stop the War Coalition has organised dozens of such demonstrations and, as far as I know, not one person has been hurt. So it can't be public safety that's at stake. No, it's the elephant in the room. This government wants to show itself as clean and new, and doesn't want attention drawn to the elephant and the mess it has left on the carpet. So it invokes an old law, to shave a little more off the arrangements by which citizens communicate their feelings to government (a process, by the way, called democracy). It would take courage for Gordon Brown to say: "This war was a catastrophe." It would take even greater courage to admit that the seeds of the catastrophe were in its conception: it wasn't a good idea badly done (the neocons' last refuge - "Blame it all on Rumsfeld"), but a bad idea badly done. And it would take perhaps superhuman courage to say: "And now we should withdraw and pay reparations to this poor country." I don't see it happening. But the demonstration will, legal or not: on Monday Tony Benn will lead us as we exercise our right to remind our representatives that, even if Iraq has slipped off their agenda, it's still on ours. Please join us.